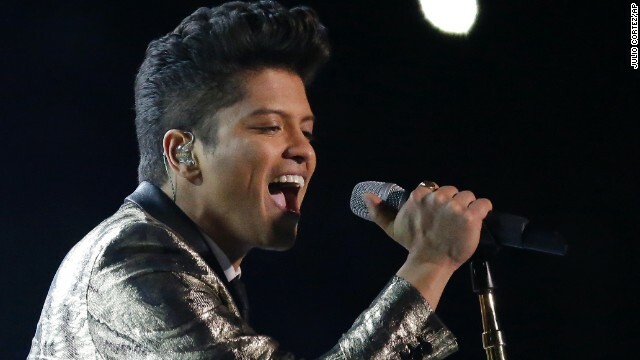 Bruno Mars is popular, safe and good for the business of the NFL. Entertainment Weekly is reporting that the NFL has asked Bruno Mars to return as the lead halftime performer for Super Bowl 50 in Santa Clara, California in February of 2016. Mars took the coveted slot for Super Bowl XLVIII where he performed a medley of his biggest hits and was joined by the Red Hot Chili Peppers on stage during a break in the action as the Seattle Seahawks defeated the Denver Broncos. Last year’s Super Bowl saw Katy Perry headline in a performance that included cameos by Missy Elliot, and a shark.